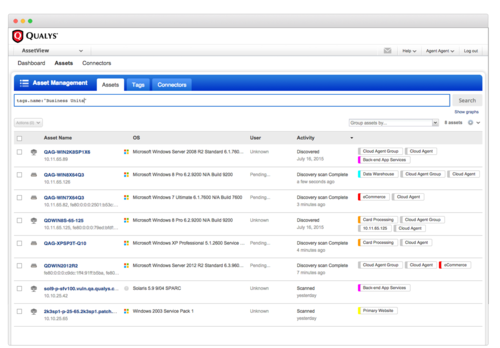 The service, called Qualys AssetView, provides an inventory of an organization's computers and their software. Administrators can use the service to run reports that compile asset information, or to run search queries to find out which of their computers are running outdated or unlicensed software, for instance. Qualys AssetView gives IT and security staff a "simple and quick way" of figuring out what assets they have and what software is on them, said Sumedh Thakar, Qualys chief product officer. To use the service, a lightweight software program, also called an agent, must be placed one each computer being inventoried, to periodically collect operational information about the device and send it to the service. The agents can monitor not only desktop computers, laptops and servers, but also virtual machines running in cloud environments. For IT and security staff, the service provides hardware inventory information, such as manufacturer and models. It provides information of all the software deployed, along with the version numbers, and what updates have been applied. The service could be used, for instance, to keep track of all the virtual machines running in the cloud, which can be handy if the organization has processes in place that automatically spin up virtual machines. Or, a security professional could use the service to find out which company computers have not been updated with the latest security patch. Qualys is primarily known for its line of products to streamline the complicated processes of securing IT systems. Asset management is a natural extension for the company, Thakar said. "In a single solution, we bring IT and security together," he said. AssetView will be entering a competitive fray of similar IT asset management products, offered by the likes of CA Technologies, BMC, ServiceNow, and Novell, among others. The Qualys service, however, is unique in that it is a cloud service, relieving the organization from managing the supporting infrastructure, Thakar said. Qualys is offering the service at no cost in the hopes that users of the service will then look at Qualys' other security products, Thakar said.